The Swaziland Rugby Unions U/18’s squad narrowly lost to Botswana in the Confederation of African Rugby U/18’s Tournament played at the Manzini Club ground in Manzini. Visitors Botswana who drove from Botswana to Swaziland showed no signs of travel fatigue and took the game to Swaziland from the whistle. Both sides played hard Rugby and it was only the courageous defending of the Swazi side that stopped the big Tswana forwards from scoring. Chances from both teams were lost due to handling errors and the heat of Manzini didn’t really help matters. 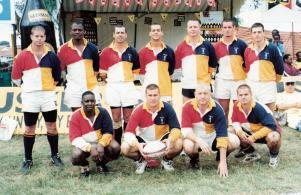 The Swaziland Rugby Union announced the appointment of the new "school's rugby development coach" Maswazi Dlamini. "Swaz" joined the SRU coaching staff on Monday and brings a wealth of rugby knowledge from around the world.